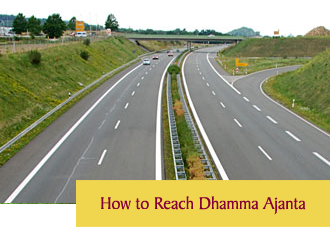 Dhamma Ajanta is situated in vicinity of outskirt of city of Aurangabad, Maharashtra State, India. It is well connected by Airways, Railways and Roads. The distance from Airport to center is 25 Km; from Railway Station its 20 Km and from Central Bus Station its 20 km. Rain fall is 35 to 45 inches in a year and temperature can be minimum 100C Grade in the month of Dec and maximum 40/410C in month of May/June before Mansoon. Climate is not humid except in rainy days. The Centre started functioning in the year 1995 in the premises of not its own.However in the year 2012 the trust purchased the 15 acres land 20km away from Aurangabad city on Vaijapur /Nasik Road located at in village Rampuri area one km inside the main road having Sulibhanjan Hills at the back drop and Deogiri Fort on eastern side with greenery all around.The construction started soon after purchase of land. The master plan of construction of center was prepared for 200 students meditation facility having an independent self contained residential unit for each one of them ,one Dhamma hall each for 100 male students , 100 female students. Two mini dhamma halls each for male and female students. Pagoda having 188 cells. Separate dining hall for male and females.The care istaken whilePlanning to make the stay of students during course as comfortable as possible so the meditation can be practiced peacefully. However as of now except construction of 50 male and 50 female students residential units and Second Dhamma hall, rest of all buildings and facilities are complete and over. The excavation of Pagoda building has recently started. Final finishing things are underway.